An edited book containing a chapter on the RCE movement was recently launched at London South Bank University (LSBU), the host institution of the London RCE (Regional Centre of Expertise) on ESD (Education for Sustainable Development). 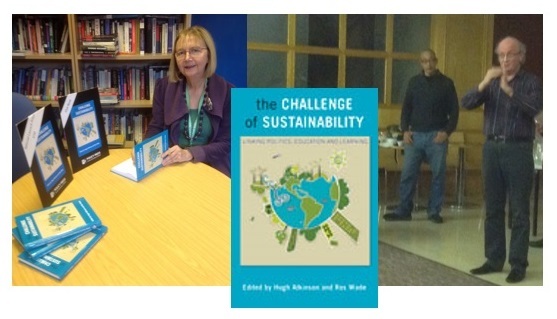 The challenge of sustainability: Linking politics, education and learning, edited by Dr Hugh Atkinson and Professor Ros Wade (both from LSBU) and published by Policy Press, has a chapter titled ‘Regional Centres of Expertise (RCEs) as mobilising mechanisms for Education for Sustainable Development’. With a central focus on the future of people and the planet itself, the book explores the links between politics, learning and sustainability. It argues that, in order to successfully meet the challenges of sustainability, we need a fundamental change in the way we do politics and economics, embedding a lifelong commitment to sustainability in all learning. The book is mainly targeted at academics and students in a variety of related subjects, including politics, public policy, education, sustainable development, geography, media, international relations and development studies. It will also be a valuable resource for NGOs and policy makers. Dr Hugh Atkinson is Senior Lecturer in Politics at LSBU. He is the author of Local democracy, civic engagement and community: from New Labour to the big society (Manchester University Press, 2012). He is a founder member of the PSA (The Political Studies Association) specialist group on environmental politics. Ros Wade is Professor of Education for Sustainability at LSBU and Director of the international Education for Sustainability programme. She chairs the London RCE on ESD.